There are many shapes in the corner that occur regularly. To save yourself the trouble of reading out their status every time, it is useful to study these basic shapes and remember their status. On this page we give a overview of many of the corner shapes commonly encountered, and some shapes that are not so common, just because they are to be avoided. An overview of basic shapes outside the corner can be found on the life and Death page. This a only a list of the Common Corner Shapes for a more exhaustive list see Corner Shapes. As it is, this is the L group. (The internal area is 2 by 3 points.) It is dead as it stands. 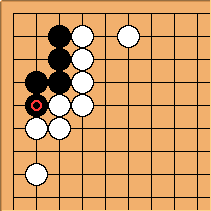 When Black has a stone at , then it is a L+1 group (specifically, an L group with a leg on the long side). The group is unsettled; namely, white can kill it, or black can live. 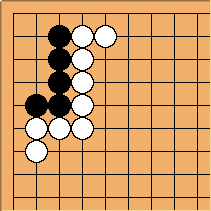 When Black has a stone at , then it is a different kind of L+1 group (specifically, an L group with a leg on the short side). The group is also unsettled; namely, white can kill it, or black can live. 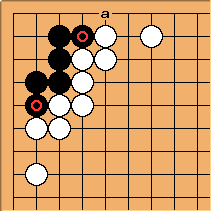 If Black has two stones at , then it is an L+2 group, and it is alive as it stands. 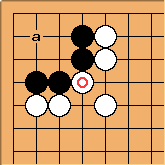 However, if there is also a White stone at a, then it is an L+2 group with descent. 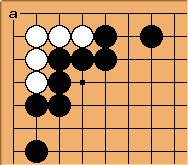 In this case, White can make a approach ko or seki. If this group has no outside liberties, white can create a ten thousand year ko. If it has at least one outside liberty, white can make seki. The Black group in this diagram is the tripod group. It is one of the smallest shapes in the corner that is alive as it stands. Black needs to remember the correct reply to three white attacks. See probe for an example of how it may form. The black shape in the diagram is the basic J group. It has the same status as an L+1 group: it lives or dies according to sente. This basic shape is known in China as the Big Pig's Snout. 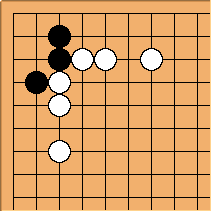 If black has a stone at b, this group is alive. 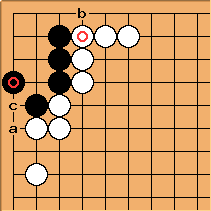 If the black stone is at c instead, it is called a "straight J group", and the best white can get by playing first is a ko. 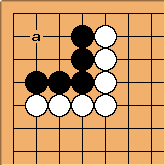 If is replaced with a Black stone, the resulting group is called a J+1 group, which is alive unless White also has a descent at a. The black formation in this diagram is the carpenter's square. The vital point is a: Black can play there to live. White can play there to turn the corner into ko. The weak carpenter's square is a carpenter's square without the connection at the corner of the shape. The vital point is the same, but this time White can kill the corner by playing at a. That is, the fact that the stone here is white, rather than Black, changes the status of the group from Black can live, White can make a ko to unsettled status. The position where is empty is also included on the weak carpenter's square page. The black formation in this diagram is the Bent Four in the corner. The vital point is a: Black can play there to live unconditionally, while White can play there to get a ko if the group has less than two outside liberties. 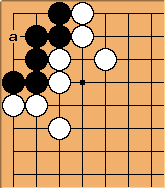 Under Japanese rules, a group which is surrounded by one or more live enemy groups and whose eyeshape can be reduced to a bent four in the corner, is dead. For the Rectangular six in the corner life and death or ko it all depends on the number of outside liberties. With no outside liberties, it can be killed outright, while with one outside liberty it can be turned into a ko; and with two, the group is alive as it stands. 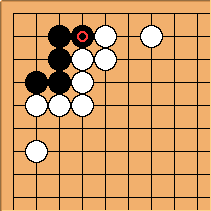 If it is white's turn, the walkie talkie seven shape can be turned into a throw-in ko. 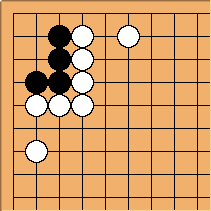 White has two occasions to turn it into seki. 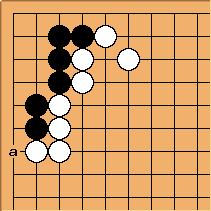 The more outside liberties, the less likely the ko will be played (and thus the more likely White makes it seki in the end). In a rectangular eight in the corner Black can easily live with 7 points of territory by playing any of the points a. For White it is more complex, its value and play depends upon the ko threat situation. If White is komaster she can often make seki with sente. Black can kill with a move at a, while White can live with the same move. White can play at a to live, black can play there to kill. When compared to the case of five stones on the second line in the corner, the Five Stones on the Third Line in the Corner has more eyespace. 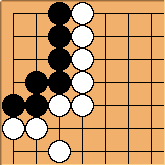 If White plays first, the group can live unconditionally, while if Black plays first, a seki or ko may be possible.